When I can expect delivery of an order? 98%* of orders are delivered within 3 working days following an order being placed. You'll receive an email update with a delivery date for when your order is due to be delivered. The actual delivery date of your order depends on the items you've ordered, distance from a JDP branch, and the availability of our vehicles. If your order is needed for a specific date, use the JDP branch finder to contact your local branch and arrange delivery before checkout. *JDP's average delivery lead time for all orders nationwide is within 3 working days, as measured by JDP's Quality Team in respect of our ISO 9001 accredited quality system. Within JDP's branch network: £15.00 incl. VAT (£12.50 excl. VAT). Within JDP's extended network: £24.00 incl. VAT (£20.00 excl. VAT). Concrete delivery: £60.00 incl. VAT (£50.00 excl. VAT). Delivery charges depend on your distance from a JDP branch. Add your delivery information into your basket summary to determine your delivery costs. Please contact JDP to arrange delivery of your order before checkout. While you still may be able to complete your order online, additional charges may be added or your order cancelled. We use reputable carriers to organise delivery of your order, and charge delivery at cost, or can help organise delivery to ports or ferries to aid the delivery of your order. In remote areas, concrete delivery may not be possible. The cost of delivering concrete products varies depending on the delivery address. If your delivery address falls within 15 miles of a JDP branch, and you've ordered less than 10 concrete items, the delivery charge is £60.00 incl. VAT (£50.00 excl. VAT). 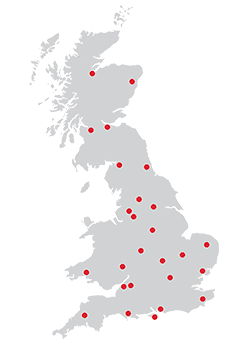 Outside of this radius, or order more than 10 concrete items, or your concrete item is not available from a JDP branch, the delivery charge is £300 incl. VAT (£250 excl. VAT). Check the product descriptions of concrete products to determine whether they arrive from a JDP branch or manufacturer. Use the delivery charge checker in the basket to determine your order delivery charges. You may be required to offload concrete on site from our vehicles, depending on vehicle type and availability, and delivery is only to the kerbside. Delivery of concrete products may take up 7 working days although they usually arrive quicker. Contact us before ordering to ensure we can meet your expectations. During March & April, JDP guarantee delivery of land drain and twinwall products to ensure your project is not delayed. This applies only to orders with less than 5 coils of land drain, or 10 lengths of twinwall. If you urgently need bulk orders of land drain/twinwall please contact us to arrange a set delivery date. If you place an order at one of our branches, rather than online, you may find an increased delivery cost. This is due to the geography and transit differences from branch-to-branch. JDP may also utilise other carriers and suppliers rather than delivering your online order from your local JDP branch. To provide a consistent service online, delivery charges are set as above. JDP has over 50 vehicles in its delivery fleet, and so most orders arrive on JDP vehicles. If accessing your delivery address will encounter parking restrictions, narrow roads, width, weight or height restrictions for a large vehicle (think a rubbish truck size) please inform us in the "Special Instructions" box during checkout. JDP reserves the right to refuse to make a delivery if you haven't informed us of any restrictions, and a driver considers it unsafe to access your property. Charges may apply for re-delivery. Usually, a signature is required to accept the delivery. Please remember to check for breakages or damaged products, or missing quantities, as once you sign for the items you accept that the order is complete. Orders are delivered on the basis that you are able to accept the order, and have the ability and willingness to manually offload items (or have mechanical offloading facilities, such as a forklift truck) from the delivery vehicle as JDP can't offload items for you. If you do find damaged products, or missing quantities, or aren't able to offload items yourself please contact us as soon as possible for us to rectify any issues with your order. Please check our returns and refunds section for timescales of deadlines for when JDP can act in these circumstances. Alternatively, you may provide instructions for JDP to leave orders in a safe place in the Special Instructions box during checkout. Please note that this is only available where JDP deliver your order, the items are able to manually offloaded, and if the driver believes it is safe to leave your order in your designated place. JDP cannot take responsibility for breakages or shortages on these occasions, and may not leave items if they are unable to be offloaded. JDP may contact you before delivery to discuss your requirements.